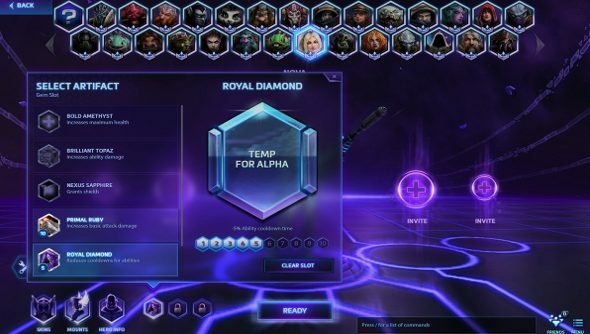 Last week, Blizzard revealed its already divisive plans for out-of-game levelling system in Heroes of the Storm. Today the developer has gone into the nitty gritty of one of these features: artifacts. The reaction from the community appears to be overwhelmingly negative. When you hit Player Level 15, you’ll unlock one of three artifact slots. Two further slots can be unlocked with gold. Gems, relics and trinkets can be placed into their specific slots, conferring bonuses to the heroes using them. It’s not unlike League of Legends’ rune system. The gem slot will be free, while the relic and trinket ones will require players to drop 2,000 gold for each of them. This isn’t the end of the spending, though. New artifacts can be purchased with the in-game currency, and all of these items can be upgraded, becoming significantly more powerful, but requiring greater amounts of gold with every upgrade. The first level of an artifact costs 100 gold, and every subsequent level will raise the price by another 100. The bonuses are substantial. A basic Bold Amethyst gem will raise a heroes health by 1.5 percent, but upgrading it to rank 10 will increase the boon to a significant 15 percent. Similarly, the Khaydarin Amulet will increase maximum mana by 4 percent at first, sky rocketing to 40 percent when it the 10th rank is purchased. Blizzard has unveiled 14 of the artifacts that will be available during technical alpha after the next patch. Six gems, four relics and four trinkets have been teased, upgrading a variety of stats and offering a diverse array of boons, from reducing death timers to increasing basic attack damage. The announcement has gone down like a ton of bricks if the comments are to be considered at all representative of the community’s feelings towards this new feature. It’s a wave of criticism and concerns. Most common is the feeling that Blizzard is, instead of trying to make Heroes of the Storm stand out from the crowd, merely following League of Legends. Other concerns range from the effect artifacts will have on balance, making people who grind for gold for hours on end have an obvious advantage over other players for out-of-game reasons to fears that it will make it very difficult for new players to be competitive. It is, of course, worth noting that artifacts are not in-game yet, and that this is a technical alpha and thus things could change. The announcement was also focused on the introduction of the artifacts, and doesn’t tackle balance at all. So there could very well be a plan in place to ensure that the worries players have will not become a reality. For instance, matchmaking may take into account the artifacts, and thus not pit players with low rank artifacts against those decked out in rank 10s. Tomorrow, at 11am PDT, Blizzard will be streaming the new content on Twitch and answering questions via Facebook and Twitter. No doubt that will provide some much needed clarity.